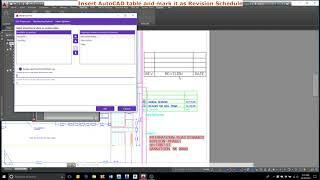 Managing Revisions for sheets in Autodesk® AutoCAD® is always a time-consuming process. This app will help you to easily manage Revisions on Sheet Set and automatically update the revision schedule on each drawing. Manage revisions on Sheet Set such as: add, delete, merge, move. Provides many options to suit your needs when numbering revisions and inserting revision schedule on drawings. Option to update Revision Number and Revision Date properties of a sheet based on the latest revision. The changes in revisions will be updated to the revision schedule with just one easy step. No need to open drawings and edit the revision schedules one by one. You will receive an activation code via your email address after purchasing the app. You can also use the app for up to 7 days without an activation code. If you would like to start with an economical option, the one-year license is available for 25USD/year, prepaid. Please make payment to https://www.paypal.me/hoangtt/25 or contact us for more information.